The Discoverer Xtreme is custom made by Motorhome-World. Your wishes will be discussed and incorporated into the design and we will ensure that your Discoverer Xtreme motorhome will be practical, capable and conform to your specification. As there are limitations to what can fit on, into and around the IVECO chassis, we will advise you on where the limits of wishes will be exceeded. 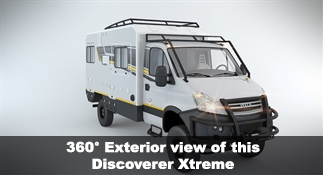 We have categorised the Discoverer Xtreme into 2 categories that describe the capabilities of the vehicle. - One for those that want to drive on-top of that distant mountain. - These are mainly short wheel base chassis' with our 3 point subframe. 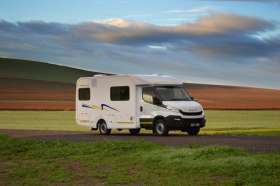 - These are light motorhomes with a low centre of gravity. - Emphasis is placed on outdoor living space. - One for those who want to drive around that distant mountain. - These are mainly long wheel base chassis' with our hard mount subframe. - These are designed with a larger interior and more luxurious furniture. - Emphasis is placed on inside living and packing space. I am interested in the "Discoverer Xtreme".